Ripley awakens in a hospital bed following a car accident. Only this is like no other hospital he's been in before - it's silent, dirty and appears to be neglected and abandoned. In a panic he flees, but what awaits on the outside is even more nightmarish than the inside - savage creatures are roaming the darkened streets. Ripley discovers he's in a city called Caligation, where the architecture is a strange combination of old and modern. Even the people are unfamiliar; dressed in a style not unlike Gothic or Victorian. But even more peculiar are the animals, or 'effigia', that follow the inhabitants around - one animal for each person. Fearing he's somehow entered another dimension, Ripley desperately tries to figure out a way back home. Brhi Stokes has written a wonderfully original and creative book. Not being a huge Science Fiction or Fantasy reader (I dip sporadically in and out), I thought I may be in for an uphill slog, but on the contrary, I was very pleasantly surprised. I was impressed by how imaginative and descriptive this book is. 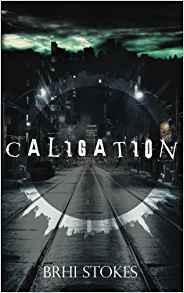 Caligation and its eclectic mix of bizarre residents felt very real, which for me is essential with a novel in this genre. I often state that I struggle with the 'world building' element associated with Sci-Fi and Fantasy, but this book had just the right balance between quantity and quality. I do think the book could benefit from some sort of speech differentiation between Caligation's citizens and their effigias (or animals). Yes, the animals in this book are very chatty! It got a bit confusing at times. Other than that, I really enjoyed Ripley's adventures and his quest to return home. My thanks to author Brhi Stokes for providing a copy of this book. This is where Ripley Mason finds himself. University dropout, casual drinker, and newly fledged hitchhiker, Ripley is tired of the daily grind of study, drink, repeat. Only halfway done with a degree he never chose, Ripley heads north to see if life won't throw him something less monotonous. Brhi has been writing ever since she could put pen to paper and daydreaming in every spare second. She adores fantasy of all kinds but has a special love for urban fantasy with a dark edge. Her fascination with different places and cultures has seen her living overseas for several years, though she currently resides in Australia. This time abroad has strongly influenced her writing, much of which focuses on strange new places. 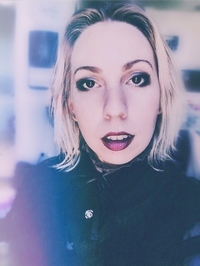 In her spare time, Brhi enjoys reading, video games, tabletop RPGs, going for long, solitary jogs and music.